Special edition cars can be pretty hit or miss. They can either offer features you really want or be completely and utterly ridiculous. This new special edition Aston Martin V8 Vantage falls into both those categories — but in a good way. Carmakers love creating special editions, almost as much as they love giving them ridiculous names. Meet the Aston Martin V8 Vantage N430. The first thing you'll notice is that yellow-on-green or red-on-blue paint job, which is an homage to the livery on Aston's Nürburgring endurance race cars and the Aston Martin CC100 Speedster. It's definitely not James Bond-subtle, but I like that it's a little more out there than your typical Aston Martin. Beauty is more than skin deep on the N430 too. 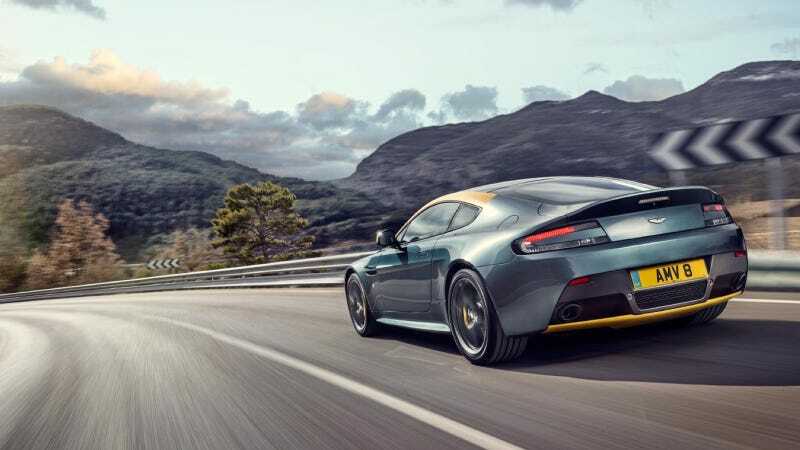 The Vantage's 4.7-liter V8 gets bumped to 436 horsepower here, putting it on par with the Vantage S. Best of all, this one comes with a six-speed manual, while the Vantage S only gets a paddle shift box. (The paddles are optional on this one too, but why go that way?) It's good enough to do zero to 60 mph in 4.6 seconds and top out at 190 mph. The N430 also drops 44 pounds over the standard Vantage thanks to carbon fiber/Kevlar sport seats and 10-spoke forged alloy wheels. Aston Martin says it's priced at £89,995 and will go on sale in the UK in the fall. No word on a U.S. release, but I think it would find some good homes on this side of the pond. We like ridiculous stuff over here.